Timing is crucial for a blues guitarist and you won't be able to hear or feel how sloppy your playing is if you don’t understand the concept of timing. You will truly improve and test your own limitations if you follow the examples from this article. In order to play your solos and chords tight you will need to have some part of the 'rhythmical spectrum' in your ear. In other words, you will need to develop different possibilities in terms of rhythm and timing. Your most effective tool to work on timing is your metronome or drum loop. If you truly want to nail this material and become a master of timing then the ultimate test is to count every beat aloud whilst playing or practicing with a metronome. Here you’ll find a lick I’ve made, it starts on the 1st beat and is made up of all quarter notes. The term quarter note refers to the length of the note being that this one lasts for an entire beat in a bar of 4/4. *The arrow indicates a string bend, the ½ means that the note is bended a semitone up. **The numbers you see are the beats, so basically what you would count to it. Now I play the lick in 8th notes, meaning each note lasts half a beat. So the tempo stays the same but the lick is played twice as fast. You will not be able to play tight if you are not able to have control when you play with different note values, such as quarter notes, 8th notes, 16th notes. If you can not switch between these note values with ease, this means your timing will be off and you won't improvise anything interesting. The good news is that you can improve your timing. Take the example above and apply the same method in your own improvisations, licks or rhythm playing. In order to use this concept freely you need to practice and experiment with it. Getting your timing right is not only technical as being able to hear the beats and rhythms in your head and feel these in your body is as crucial as being able to execute them. Playing tight can also be seen as playing steady, it is about playing any kind of rhythm, perfectly placed, in any part of the bar. When playing rhythm it is important to not slow down or speed up. If there are parts in the bar where you aren’t able to play steady then you need to develop your feeling and hearing. 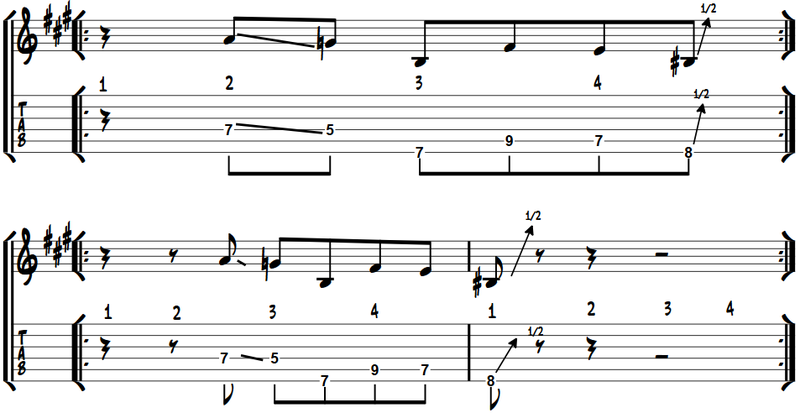 Try and practice the following licks. These are very specific variations of the lick above to help you develop your timing. In this example you see the same lick moved one 8th note further in the bar, so instead of starting on the 1st beat it now starts between the 1st and 2nd beat (called 1&). You should be comfortable playing a lick like this, no matter on which part of the bar you start it. Also check if you can play this lick but starting on the other possible places in the bar. You should repeat each version consecutively in order to really get it in your ears. If you want to be able to incorperate these skills while playing freely (improvising or comping) the first step is to use a blues guitar lick you already know. In trying these examples you’ve probably noticed that is hard to apply this timing to the same lick or that you didn’t get it right as fast as you thought you could. This shows how much you should work on timing. Note that this information can be applied to other licks, solos, improvisational and rhythm guitar parts. Make sure you can play it tightly and then move the lick so it starts on the 2nd, 3rd or 4th beat of the bar like in the previous examples with the 8th notes. Developing a feel for triplets is a must for every blues guitarist at some point especially in learning how to play shuffle rhythms. It is highly recommended to practice scales in this way. Try playing them in triplets and also combine triplets with 8th notes. You can for example ascend the scale in 8th notes and descend in triplets. Can you play two bar phrases? With this I mean very rigidly start playing a phrase in one bar and end it in the next bar. It doesn’t matter whether you improvise or play a lick you already know. So start after A and end before B. Many amateur players solo “over the bar line” without really understanding it. This lack of timing awareness causes solos to sound shallow like a chain of meaningless notes. To avoid shallow sounding solos try to keep playing two bar phrases for a while with a metronome or backing track as practice. The ultimate way to improve fast is to record yourself and check back to make sure you’re not cheating by playing over the bar lines. From a musical point of view two bar phrases will give your solo a question and answer feel. Also it will make sure you leave spaces in your solo and don't overcrowd it with meaningless notes. Starting your solo off with two bar phrases gives you a lot of possibilities to build up to be interesting and dynamic. When you’re just jamming you are free to play over the bar line, this may even sound great. The important thing is to become aware off the difference between fitting a phrase in one or more bars or starting your phrase before the bar line. Now you are studying or practicing a concept to develop your ears and feel of timing. A huge part of timing is really knowing when you play over the bar line instead of blurting out notes and licks. Trying to pick up 'where you are' in the bar from listening is a big part of timing. When someone’s talking without really reaching a conclusion but rattling on without leaving some space between sentences. It is not pleasant to listen to, right? It is the same way with playing. Practice making phrases in two bars and become accustomed to play anywhere in the bar in order to gain control and become an experienced blues guitarist. This information and exercises will help you most if you apply them while improvising. I would recommend to study my free guide on how to play at a blues guitar jam in order to integrate these exercises on timing in a non-isolated way.